Rome, Italy - Spanish authorities announced the arrest of 76 people involved in a large illegal trade of bluefin tuna worth over €12 million per year between Malta and Spain, and with the engagement of other EU countries. 80,000 kg of illegally caught and marketed tuna were seized in the investigation, led under the coordination of EUROPOL. Irregularities found in the conservation of the fish could also cause food poisoning. The international investigation has discovered a large network of fishing companies and distributors that includes also one of Europe’s biggest seafood farming companies, the Ricardo Fuentes and Sons Group, based in Spain. The investigation provides crucial information ahead of the meeting of the International Commission for the Conservation of Atlantic Tunas (ICCAT) taking place from 12 to 19 November in Croatia and where fishing nations and the EU will agree on new measures to manage the lucrative fishery of the east Atlantic and Mediterranean bluefin tuna. “It’s simply unacceptable that such a massive trade of illegal bluefin tuna involving European companies and worth millions of euros has managed to escape the controls of governments and most especially the EU institutions. Bluefin is one of the most economically valuable fish on the planet, therefore we need stronger rules and better monitoring to effectively protect the stock. 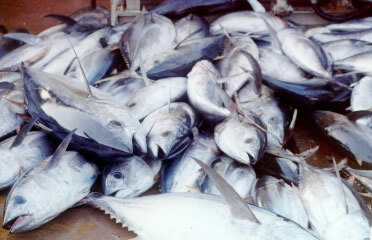 According to the investigation, Malta was one of the main sources of the illegal tuna that was sold and traded together with legal quantities. Here about 2.5 million kilos of undeclared tuna  are estimated to be sold for a total profit of €12.5 million per year. Italy was the starting point of another route: all the products came from illegal catches and were transported to Spain by road without any type of documentation and without any system of traceability and distributed to smaller businesses in the sector. French ports were used for transferring the illegal goods from Italy to Malta. The investigation also reported several health and hygiene irregularities regarding the conservation of the fish after being caught, that could have caused food poisoning among consumers. “All illegal seafood that reaches our plate has escaped the traceability and hygiene controls that are so important to protect our health. Tackling illegal fishing is important to protect our ocean as well as our own health.” concluded Buzzi. The 2,500,000 kilos of undeclared tuna estimated to be traded in Malta corresponds to nearly 10% of the total allowable catches for the stock for 2018. ICCAT- the International Commission for the Conservation of Atlantic Tunas - is an inter-governmental fishery organization responsible for the conservation of tunas and tuna-like species in the Atlantic Ocean and its adjacent seas. The ICCAT consists of 51 contracting parties including the United States, Japan and the European Union. In 2017, WWF criticised the decision by ICCAT to adopt a gradual increase in bluefin catch quotas of up to 36,000 tonnes by 2020.This was the highest total allowable catch ever set for bluefin tuna. Scientists warned that bluefin tuna stock is not yet recovered and is expected to decrease with such a catch level. In 2018, the ICCAT scientific committee has suggested the Commission to move from the current recovery plan to a management plan for bluefin tuna. WWF advocates for management measures that will not jeopardise the full recovery of the species. Decades of overfishing had brought the stock to decline. A decade long fight to save the finest fish of the ocean from disappearing: "The Battle for the Bluefin"